I PLAN TO COVER "THE BIG PICTURE" IN ITS ENTIRETY! So, next week I will embark on a grand adventure. 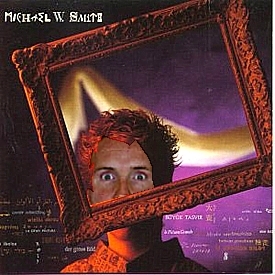 I will attempt to take the seminal 1986 masterpiece of Michael W. Smith and cover it in an effort to re-introduce the content to the un-knowing public, as well as bring smiles to those who are familiar. Wish me luck friends. I will post each song on this thread as I finish it. Interesting take on this album. "Interesting"? Only in a perverse sense. Of course the writer of the Web site fails to mention that the back of the album is simply the mirror image of the front, because that would damage the point he is trying to make. Having counseled teenagers in satanism, I know one of the first signs of satanic influence is writing backwards! As someone who actually HAS counseled with teens heavily involved in self-styled satanism, I've never knowingly run across a teen satanist who had much interest in writing backward. But something even more frightening appears on the album . . . The M in Michael and the T in Smith is part of the Runic (runic means secret) alphabet used in witchcraft and satanism! Only someone involved in the occult would know such an alphabet exists! Uh oh!! The author of the Web site is obviously an occultist!!!! How ya gonna feel, oh, tomorrow, when the day reveals what you believed was for the sake of love... Don't ya think you're old enough to know? He's fictional, but you can't have everything. Dear Lord. The first time a girl ever held my hand was at a Big Picture-heavy Smitty concert at Expo 86 the night before my 16th birthday. September 30 weighed heavily on my mind for years afterwards. Hmmm, and my twins were born two days before that woman's birthday. We're still friends, and this year is the first year since, well, 1986, maybe 1985, that I haven't called her on her birthday. I think I was a little too busy this time around. all I want to know is, did ELIM HALL open? now *there* was an underappreciated band..
things are looking good for the project, everyone.. I have already mapped out the tracking for "Lamu", "Wired for Sound" and "Voices". I'm taking a Jamie Lidell meets Postal Service approach to this whole thing. It's gonna be soulful, dancible and ballsy. : all I want to know is, did ELIM HALL open? At Expo 86 in Vancouver on September 30, 1986? Absolutely! They were a Canadian band, after all. or "Let's Play Science Says", a total pro-creationism rant (in a new-wave song? )..